Sales of electric and internal combustion engine two wheelers are strong in China and India followed by the Southeast Asian countries compared to other regions of the world. Two wheeler scooters and motorcycles are most popular mode of transport in APAC region owing to their high fuel efficiency and ease of riding in congested traffic. As a result, consumers in Asia Pacific region are profoundly adopting traditional two wheel vehicles. Much of the present growth of scooter and motorcycle usage in Asia Pacific region is correlated to the rapid urbanization of the developing countries in the region and rising middle class family incomes. These trends led people to spend more money on transportation, as well as need for transportation to travel to work. On the other hand electric two wheeler segment growth has been taking off since last decade with highest sale in China. Spiked e-scooter and e-bikes market in China is also favored by the government initiatives such as banning conventional fuel two wheelers in major cities and by building up public charging infrastructures in the country. In 2010, China sold around 27 million units of two wheelers in country and then gradually decreased over the next five consecutive years. Comparatively, two wheeler sales in India have been on uptrend from past few years with 13 million unit sales in 2012-13 and more than 16 million unit sales in 2014-15. Moreover, South East Asia countries such as Thailand, Vietnam, Indonesia has been witnessing significant growth in two wheelers sale with production in Philippines rose to 31% to 1.04 million units annually. Asia Pacific region is the largest market for the two wheel vehicles across the globe, where IC engine powered two wheelers dominates the Asia Pacific two wheelers market. On the other hand electric powered bikes and scooters are also growing significantly in the region with China, Japan and India leading the electric bikes and scooters market. China accounts for the largest market e-scooters and highest adoption rate owing to government stringent environmental regulations for vehicle emissions in major cities and relatively low cost of e-scooters and bike than conventional two wheelers. The electric two wheelers market is China is escalating gradually since 2005, when sales of electric scooters reached about 50,000 units per year. Since then, over 145 million e-scooters have been sold. E-scooters have now become the most popular mass-produced alternative vehicle in China. Light motor cycles or low cc motorcycles will remain the largest internal combustion product segment in terms of sales as they offer high fuel efficiency and at lower costs. Internal combustion engines comprise one third of the total APAC two wheelers market in 2016. Rising adoption of scooters by women riders in Asia region is also one the recent trend driving the growth of scooters market in the region. For instance, in India more than 35% of the scooter owners are women. 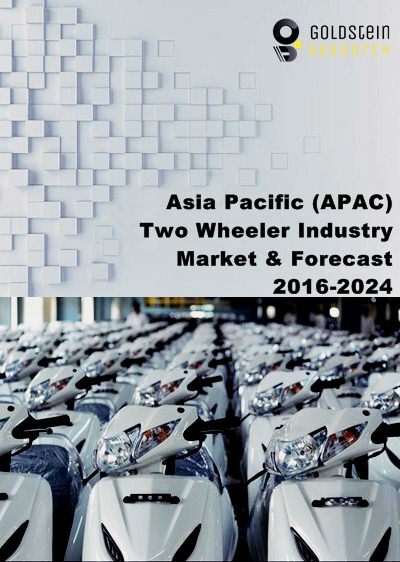 The Asia Pacific two wheelers market valued USD 76.4 billion in 2016, including electrically powered two wheelers and also accounted for more than 110 million units sold in 2016. Further, the market is anticipated to expand at a CAGR of 6.2% to reach USD 123.6 billion over the forecast period owing to absence of reliable public transportation system and high cost of passenger cars. Geographically, India accounted for the largest sales of two wheelers in the region with more than 17.5 million unit sales in 2016. India is closely followed by the China with more than 11 million unit sales of two wheelers in the region. Philippines recorded the third fastest growth in the region behind Indonesia and Thailand which sold around 6.22 million units and 1.74 million units respectively in 2016.